"... All that copyhold messuage or tenement with the appurtunances with the barne, Stable, and other buildings erected upon the same lately by myself purchased of Mr. Baker and all the other ground belonging thereunto conteyning two acres more or less situated and being in Whitton..."
The property was left to his wife Anne on his death; his will gave her the disposal of tbe Whitton property to which ever of her daughters she wished. The eldest daughter, Lady Honora Abergavenny inherited the property in 1694. It then passed to the second daughter, Lady Barbara Webb, wife of Sir John Webb, in 1706 (presumably on the death of Honora). Sir John Webb then sold the property to Richard Harcourt and Nevill Ridley in 1715, Harcourt and Ridley acting as trustees for Nathaniel Pigott. In 1738 the property was surrendered to Richard Harcourt junior on the death of his father. Then in 1761 Nathaniel Pigott, the grandson, was admitted to the property. 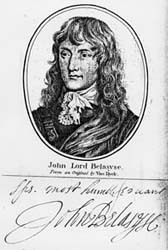 Therefore the house was owned by the Belasyse family till 1715. Then the Pigott family, at first through trustees, till about 1778. In 1778 it was purchased by Samuel Prime of Kneller Hall and then demolished to clear his view. The two acres which contained the house are listed as a kitchen garden in the prospectus for Kneller Hall, when it was sold in 1846. 1702	to 1711. Lord Dunbar. 1763	Esq Potter or Pigott Esq. Land late St. Paul had. (The rate collected was far less than that for the house and land.